Back in June, I wrote about algorithms I was working on to take the volunteer data and spit out the “correct” classification of for each image. First, I made a simple majority-rules algorithm and compared its results to several thousand classifications done by experts. Then, when the algorithm came up with no answer for some of the images (because there were no answers in the majority), I tried a plurality algorithm, which just looked to see which species got the most votes, even if it didn’t get more than half the votes. It worked well, so I’m using the plurality algorithm going forward. One of the things I’ve been curious about is whether we can detect when particular images are “hard.” You know what I mean by hard: animals smack up in front of the camera lens, animals way back on the horizon, animals with just a tip of the ear or a tuft of tail peeking onto the image from one side, animals obfuscated by trees or the dark of night. So how can we judge “hard”? One way is to look at the “evenness” of the volunteer votes. Luckily, in ecology, we deal with evenness a lot. We frequently want to know what species are present in a given area. But we also want to know more than that. We want to know if some species are very dominant in that area or if species are fairly evenly distributed. For example, in a famous agricultural ecology paper*, Cornell entomologist Richard Root found that insect herbivore (pest) species on collard greens were less even on collards grown in a big plot with only other collards around versus on those grown in a row surrounded by meadow plants. In other words, the insect species in the big plot were skewed toward many individuals of just a few species, whereas in the the meadow rows, there were a lot more species with fewer individuals of each species. 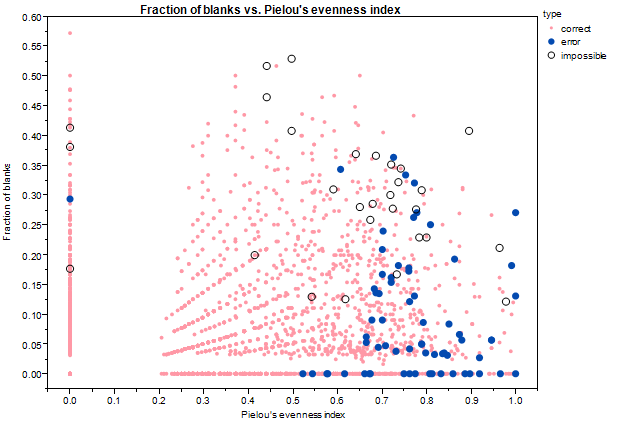 Okay, back to the Pielou index: we can use it to judge how even the votes are. If all the votes are for the same species, we can have high confidence. But if we have 3 votes for elephant and 3 votes for rhino and 3 votes for wildebeest and 3 votes for hippo, then we have very low confidence. The way the Pielou index works out, a 0 means all the votes are for the same species (high skew, high confidence) and a 1 means there are at least two species and they all got the same number of votes (high evenness, low confidence). Numbers in between 0 and 1 are somewhere between highly skewed (e.g. 0.2) and really even (e.g. 0.9). Another way we could measure the difficulty of an image is to look at how many people click “nothing here.” I don’t like it, but I suspect that some people use “nothing here” as an “I don’t know” button. Alternatively, if animals are really far away, “nothing here” is a reasonable choice. We might assume that the percentage of “nothing here” votes correlates with the difficulty of the image. So we do seem to be able to get an idea of which images are hardest. But note that there are a lot more correct answers with high Pielou scores and high “nothing here” fractions than errors or “impossibles”. We don’t want to throw out good data, so we can’t just ignore the high-scorers. But we can attach a measure of certainty to each of our algorithm’s answers. * Richard B. Root. 1973. Organization of a Plant-Arthropod Association in Simple and Diverse Habitats: The Fauna of Collards (Brassica oleracea). Ecological Monographs, Vol. 43, No. 1, pp. 95-124. Don’t get me wrong – it’s really nice to have running water, internet, and my pick of fresh vegetables from the weekend farmer’s market. 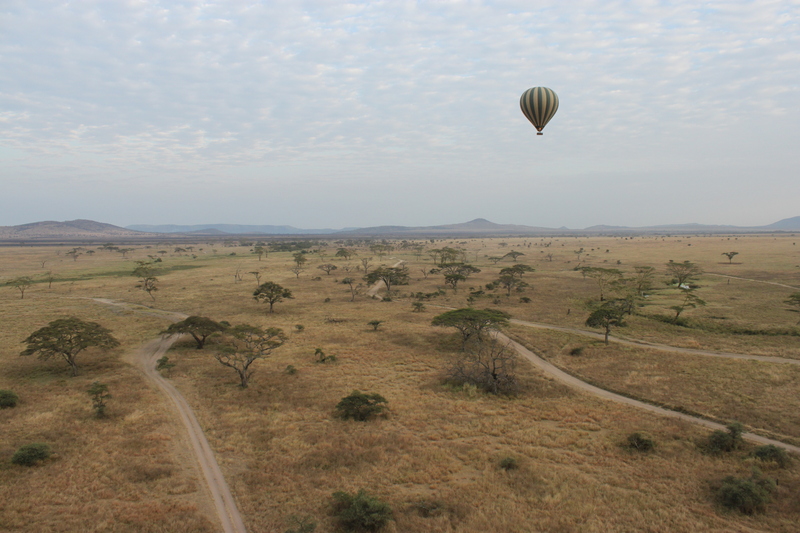 But sometimes I miss the Serengeti. Watching from my window in Minnesota, I’m lucky if I see a squirrel. And let’s face it — squirrels are only so exciting, for so long. 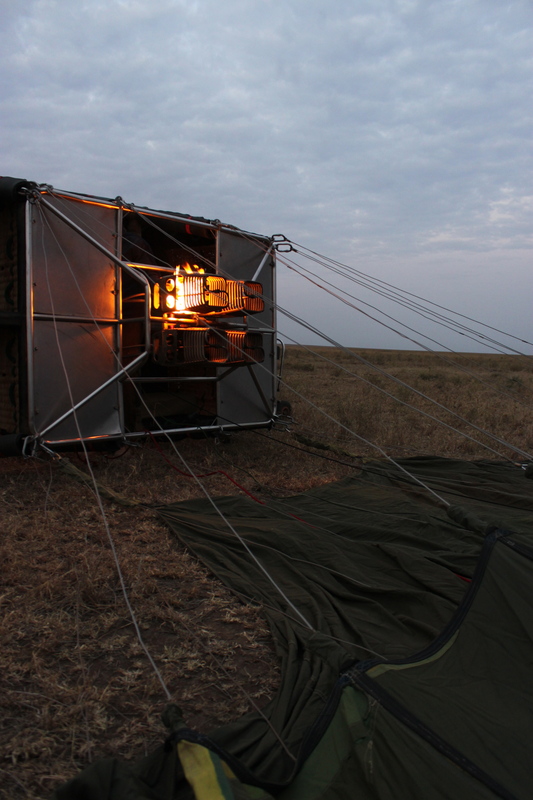 SBS has been flying balloons in Serengeti since the 1980’s, and has always helped us researchers out whenever they could, from letting us drag our hand-held tracking equipment up for flight to listen for lost lion prides, to letting us tinker with our Landrovers in their garage. In fact, they sponsored a lion cub during one of our fundraising campaigns a few years back – and now there’s a cub named “Balloo” living in the Mukoma Gypsies pride in the heart of Serengeti. I went up for my first flight in 2010. George Lohay, Stan’s predecessor on the project, and I had to wake up at 4 am to make it to the launch field on time. That really is as terrible as it sounds, however, that morning it saved us from an invasion by the relentless carnivorous safari ants (siafu). Well, to be more exact, we were able to flee the house before the ants had invaded our beds, meaning we escaped with minimal damage. And by the time we returned that afternoon, the ants had already moved on. 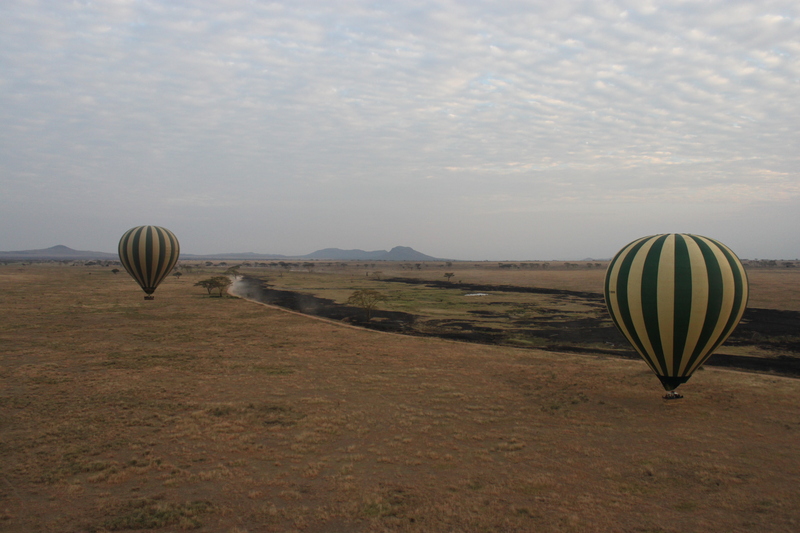 I’ve been thinking about balloons lately because one of SBS’s pilots and a dear friend of the Serengeti Lion Project & Snapshot Serengeti, Jason Adams, is currently preparing to defend his title in Canada’s upcoming National Hot Air Ballooning Championships. 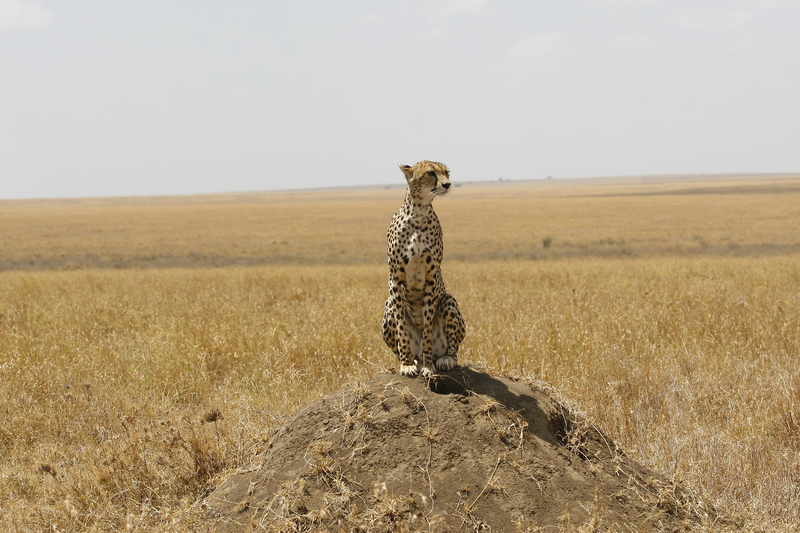 Everyone in Serengeti and on the Snapshot team will be rooting for him. Good luck Jay! I got to spend all of last week at a movement ecology workshop in Zurich, Switzerland – conveniently beating the heat wave Minnesota has apparently been having! Migration patterns of the sooty shearwater, revealed by Scott Shaffer of UC Santa Cruz in a new study. Movement ecology explores both how and why the way animals move the way they do, and what this means for them as individuals, as populations, and species. What triggers do animals use to decide where to go and what to do while they’re there? Why are some species territorial, while others overlap? Why are some species migratory? What do these behaviors mean for their individual fitness, their population dynamics, and global distributions? 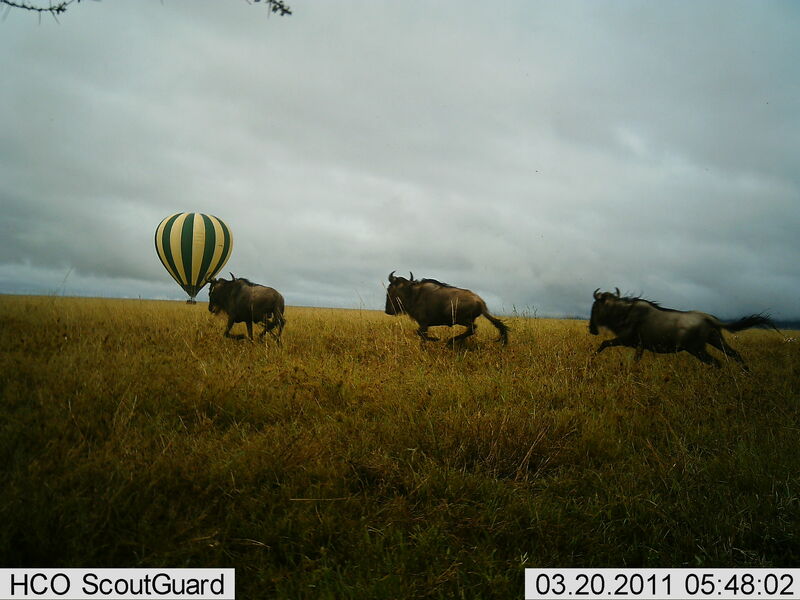 How does our understanding of animal movement change the way we try to protect species and the habitats they need? 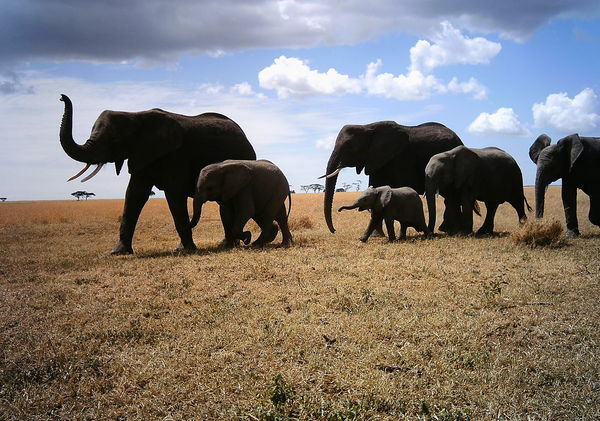 It’s a pretty big field…and it’s one that is growing in leaps and bounds with modern technology – from camera traps to GPS collars, vast satellite networks and high resolution global imaging – we are able to ask questions about movement and distribution that would have been impossible just a few decades ago. For example, researchers from London’s Royal Veterinary College recently discovered that cheetahs – contrary to popular opinion – might not rely on their top speed to catch their dinner, but instead their agility and acceleration. In captivity, cheetahs had been clocked at nearly 105 km/hour – but new, lightweight, super-fancy GPS collars let researchers take these speed tests to the wild. What they found was that cheetahs in the wild averaged about half that speed – but that they accelerated and turned with unparalleled power and agility. Which means that our long-standing perception of cheetahs as needing wide open spaces for really fast chases might not be accurate – and that they might actually be able to hunt quite well in the woods! This is just one of many, many secrets that the field of movement ecology, with the help of modern GPS technology, is uncovering. Some other stories are a little less exotic and closer to home. The Today Show recently covered the amusing tale of a concerned cat owner who designed a tiny tracking device to see just where her pet was going every day. Her sleuthing turned up some interesting results – not just for cat owners, but for scientists too — and scientists are now encouraging cat owners around the country to track their cats and share their data on an online repository called Movebank.org. So if you have a cat and want to see where it goes when you’re not looking, or help scientists understand how domestic cats fit in to the larger ecosystem, check it out!